I fell off my horse, and I distinctly remember hitting the ground. I splatted like a pancake, and I started to cry, not because it hurt, but I was so relieved that it didn’t hurt. A huge wave of relief went through me as I realized it was not a disaster. It is not every time you fall off that you break your back, or are unconscious, or your horse dies. Sometimes you just fall off and you’re a bit stiff after, but it doesn’t really hurt. That much-needed realization came as I lay on the ground just weeks after losing my best horse, Avensis 4. He was the horse that helped me start the climb to the highest levels of equestrian sport. He instilled the confidence in me that I could really do this. I jumped my first 1.60-metre competitions on him, my first World Cup qualifying event, and my first $1 million Grand Prix. I thought he would be the horse that would take me all the way to representing the Canadian Show Jumping Team on the world stage. Instead, in September of 2013, as we soared over an open water jump, something went wrong. As we landed, we both came crashing down. I was pretty badly injured, and I was unconscious for a rather long time; something that proved to be a blessing in disguise. Because what I didn’t know as I was out cold on the ground was that Avensis 4 — a horse that I not only relied on in the competition ring but was also deeply emotionally attached to – had broken his shoulder and had to be euthanized on the spot. I was crushed. It’s one thing if your horse gets sick and has to be put down. It’s quite another when you aim him at a jump and something goes wrong. That hit me hard, and I was ready to throw in the towel on riding and my competitive goals. Fortunately, I’ve always had my family in my corner, and they, along with my trainer at the time, 2008 Canadian Olympic team silver medallist Jill Henselwood, gave me the incredible support and encouragement that I needed to not quit the sport that I loved. As I struggled with the loss of Avensis, I remembered that it was not the first time I have overcome obstacles, and it certainly would not be the last. At 18, when I was just beginning my competitive riding journey and my quest to be a part of the Canadian equestrian team, I was thrown hard and fast from a young horse, head-first into an arena wall. I can still remember thinking, ‘oh my God, I’m going to snap my neck!’ as I went careening toward the edge of the arena. I tucked my neck as I hit the wall and fell to the dirt, and I didn’t break my neck. Instead, I broke my back, a 90 per cent compression fracture on L3 vertebra. I was told I would have been paralyzed if the damage had been one vertebra higher. It was a near-miss and a miraculous one, and it was also at major devastation at the beginning of my career. Injuries and broken bones are part of the sport, but this one left me sidelined for several years. It also, for the first time, implanted a sense of fear. I was fearless growing up riding, but something changes once you realize how seriously you can get hurt; you become a lot more cautious. But when something is so much a part of your life, and you love it as much as I love riding and competing, it’s hard to stay away. There’s a little bit of a hole in your life if it’s gone. Injuries didn’t matter. I just wanted to get back into horses. The first time that I got back on a horse, years after breaking my back, I was absolutely terrified. I didn’t think I would be, but when it actually came time to put my foot in the stirrup and get on, it felt like people were punching me in the stomach. For about five or 10 minutes, I felt like I was going to be sick. Then all of a sudden, that feeling went away. All of the things I had learned while riding as a teenager were still there, and it just felt comfortable again. Overcoming that injury got me back on the road toward my ultimate goal of donning the red Canadian equestrian team jacket at the Olympic Games. It felt like everything was falling back into place. And then I lost Avensis. It was another major setback and obstacle to overcome. What I have found, though, is that when you have come so close to achieving something you want and you really, truly believe that you can get there, you keep going. Not long after Avensis’s passing, another horse named Zilversprings came into my life. While I love all of the horses that I’ve ever had the privilege to ride and work with, he is the only other horse that I bond with — as I did Avensis. With Zilversprings, I represented Canada in Nations’ Cup team competition for the first time in Slovakia in 2015, jumping both rounds of competition without knocking down a fence. We repeated that perfect performance at the 2016 Nations’ Cup in Gijon, Spain, where “Zilver” was the only horse to jump clean throughout the entire competition. We were also named as the travelling alternate for the 2015 Pan American Games team, which was a huge goal and accomplishment for me. Then, last summer, “Zilver” jumped all three rounds of the $500,000 Queen Elizabeth II Cup at Spruce Meadows in Alberta without a single rail down. We placed second. That was also an absolute dream come true. At that same time however, while one dream was being realized, I watched another one slip through my fingers. I spent the summer of 2016 bringing Zilversprings back from an injury, playing a bit of catch-up throughout the summer, hoping his performance and fitness would peak during the week of the 2016 Rio Olympic selection trials. In my heart, I knew I just needed one more week to get the fitness that I needed on him and sure enough, I was right. 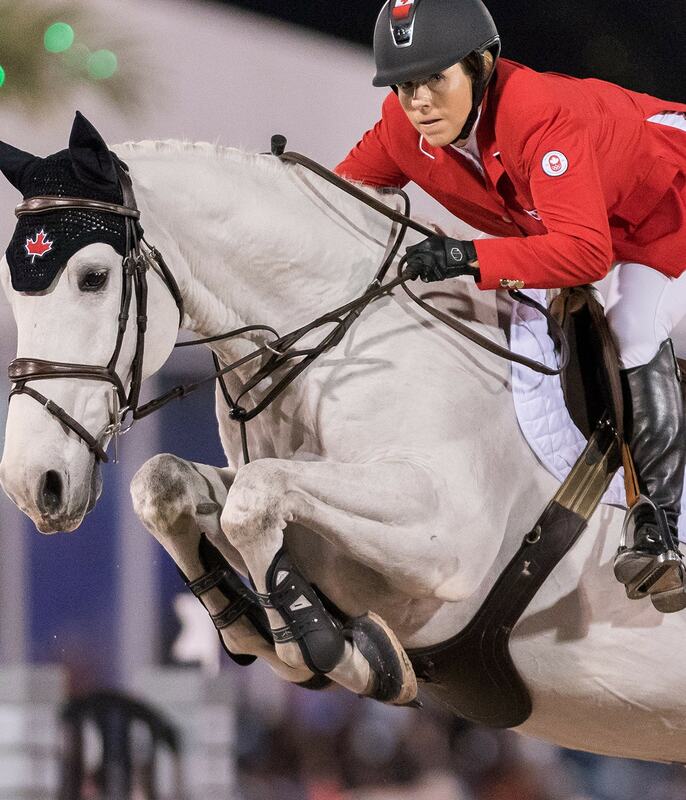 His second-place finish in the $500,000 Queen Elizabeth II Cup, one of the best performances of his life, came one week after the Olympic selection trials. If we had shown that same form one week earlier, perhaps a spot on the Canadian Olympic team could have been ours. It was a heartbreaking realization, but that’s when you have to step back and take things day-by-day. You have to concentrate on the positives in what you have accomplished. You have an end game in mind, but if you get too concerned about the big picture, it can become overwhelming. You have to break it down and just keep working at things day-by-day. I always remind myself to enjoy the incredible time that I have with my horses. At the end of the day, the horses are what keep me at it, reaching for my goals. Gingras and Zilversprings complete flawless round. So, that’s where I find myself today. I’m enjoying the process and not letting any hurdles get in my way. This summer, I would love to make the Canadian team for the prestigious Nations’ Cup event in Aachen, Germany. Then, if I have the horse power and I could be a helpful team member for Canada at the Nations’ Cup jumping final in Barcelona that would be an honour. And my ultimate goals are still competing at the world championships next year and vying for the next Olympics. If we get there, it will have been by way of a bumpy road, but I always remind myself what I tell other riders, especially young riders starting out in the sport: It’s a really hard journey, but it’s worth it. You need to be determined and resilient because the person that keeps going and keeps trying is the one who is going to get there. So I’m coming back, and I’m trying again.